Two pictures taken on the occasion by the ADC were sent to us with a letter of thanks from the Raj Bhawan. Needless to say that the old man went back very happy, and said some kind things about our unit to the GOC. As a direct consequence of this visit, I decided to leave all arrangements for our annual inspection to Hari. He has now written an account of the inspection, which is given below these pictures, in his own words. “All hands on the deck!” and they were there within ten minutes! Sharpen your Saw – says the 7th of the seven habits of highly effective people propounded by the well-known Management Guru late Stephen Covey. To an EME Soldier Craftsman in the Indian Army the motto is “ Karm hi Dharm “ – Work is Supreme Duty. He has to not only keep his technical skills and knowledge up to date to keep the Army Equipment entrusted to him battle worthy at all times but also sharpen his saw – his physical fitness throughout the year whether he is in a Peace Station or on field duty in the borders facing a live enemy. An EME Battalion has to go through not only a Technical Inspection by a department head every year or more frequently if the situation warrants it , but also will have to prepare for an Annual Administrative Inspection by the GOC of the division and his staff over several days . The D minus activities starts months before taking care to ensure that the primary technical duties are not compromised. In addition to a ‘book inspection’ by the divisional staff, the inspection also includes the visit by the GOC to the Battalion to check the battle worthiness of the unit. He goes around the barracks, checks the unit lines, cook house , unit transport and the training area. Most important but troublesome items of this inspection are the visit to the firing range and the BPET [ Battle Physical Efficiency Test ] he directly witnesses . The following story revolves around one such inspection where our EME Battalion was deployed supporting a Mountain Division facing the Chinese Army in East and North Sikkim . 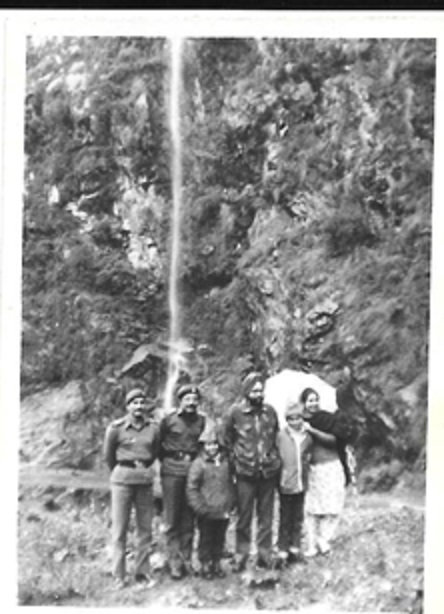 I was the second- in – command and Lt Col Surjit was our CO . Col Surjit trusted me and left it to my wisdom to prepare the unit for this onerous task, never interfering treating this whole exercise as an occupational hazard. We practised really well, taking into account the reputation of the GOC General V N Sharma for excellence in everything with proper direct evidence on the ground. On the appointed day and hour early in the morning, the GOC arrived at our location to witness the BPET Test accompanied by his staff. Our CO received him .The test involved all ranks [ a representative force of about 100 men , JCO and Officers led by me running 2 miles dressed in FSMO [ Field Service Marching Order with weapon weighing approx. 20 plus kg ] . Before the start of the test, the GOC inspected some of the FSMO kit to ensure that we were wearing the regulation items. When he went around, something caught his eye . We had prepared covered enclosure in compartments for the runners to finish the test and move in to enable the divisional staff to capture the results – How many in EXCELLENT [ below 12 minutes ] GOOD [ 14 minutes] SATISFACTORY [ up to 17 minutes] and POOR [ above 17 minutes] . There were only three compartments, the largest one marked EXCELLENT, a small one for barely 10 people marked GOOD and a very small enclosure marked SATISFACTORY . Gen Sharma called me and asked me “Do you think this will be the result ? No failures?” with sarcasm evident in his tone . I saluted him and answered “YES SIR”. Sikkim being a hilly terrain, the running involved going uphill on the road for one mile and running back one mile downhill back to the start point where the GOC was present. We had a Transit Camp exactly one mile away and the ‘Turn Around’ point was marked there. Of course, the divisional staff ensured that everyone ran for full 2 miles . [We had practised this for weeks together and I knew our officers, JCOs and men well and was confident of the result I visualised. The 'SECRET' here was we were running downhill to finish gathering momentum from gravity] When we finished the test , out of the 100 who participated, 94 came in EXCELLENT, 5 in GOOD and only one in SATISFACTORY timings. The GOC could not believe it. He said let me measure the distance myself. He asked Col Surjit to drive him through the two-mile route measuring the distance on the odometer of his jeep. They did that and found it correct. He wanted the Adjutant to call eight men from among the sentries who were positioned with red flag around for safety reasons and also some men who were to do the repair of the targets after every firing. He said I want these 8 men to fire first. The adjutant obeyed the command and changed the detail. To the GOC’s total surprise, all the 8 men hit the ‘bull’. He could not believe it again. [What the GOC did not know that these sundry men were, in fact, our Marksmen and we had anticipated this to happen, knowing the GOC’s reputation! ] . Harikumar is known for his graphic memory. This event occurred about 35 years ago, but as far as I remember, both these ‘tricks of the trade’ were maintained as a secret from me, successfully kept by Harikumar and Dhiraj. In fact I was myself surprised by the sharp shooting of sentries hanging around the range. Be that as it may, the performance of our boys gave a lot of confidence to me. 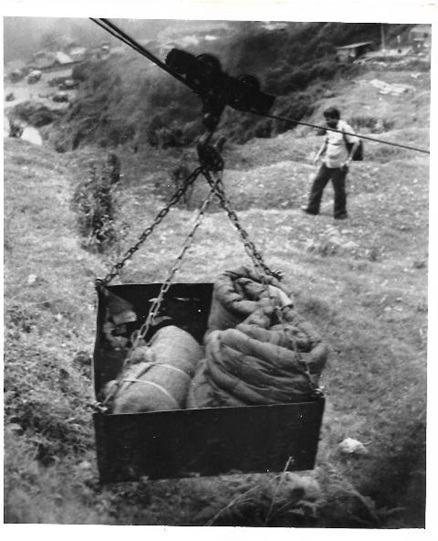 I acquired the courage to show a demonstration of a ropeway trolley which we had hurriedly rigged up with our recovery equipment. 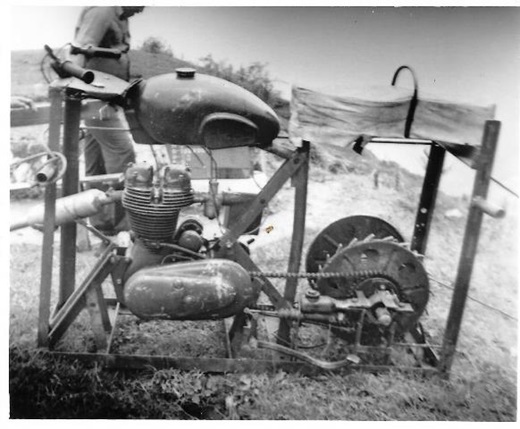 Hari has already posted a story of that contraption on the blog, which may be seen by clicking on the link given below. From my archives, I have retrieved a few pictures, which are given below. And right in the end there is a picture of one of the hundreds of ‘water-falls’ which we saw in Sikkim. Their sight motivated us to rig up a micro-hydel plant. Jacob Mathews has sent me details of that device, and I am hoping that he will write that story. The wheels of a motor cycle were removed. And the rear wheel was replaced by a drum, which was designed to pull the trolley. Water falls of this kind were a common sight. We saw an enormous potential for hydel power, without building any dam. Hari has, indeed, penned it very well. 35 years is a long time, but he has a terrific memory! Must commend you to project Brig HariKumar in the forefront and giving the credit where it is due. A good second in command is half the work done already. He is a perfect example of a great administrator and capable of reading his commander’s mind. Peace time living for the Services is solid hard work in maintenance and training. Yes. I was lucky. Hari is a very balanced officer. And we got along extremely well. He was approved for promotion to the ‘two-star’ rank, but he did not have enough service left. He then served in the corporate sector and did a commendable job. His children, Jaya and Raghu have done us proud by their performance. And Malathi, his wife is indeed the sheet anchor of the family. I served for 36 years. But the two, which I spent in the land of the Teesta and the Kachenjunga were the best. I am enlightened by Brid Harikumar. Attached find a blog that may enlighten some of your viewers on the impacts of climate changes. I request that it be published on your Webpage, Guftagu @ amolok.in. I am a civilian history buff. Over years through media reports observing progress of Indian armed forces from 1950s to present I had concluded that any nation incapable of maintaining its armed forces in battle ready state to be available for active duty at a short notice for preserving its territorial integrity is a potential target for colonization (950 to 1947). As a college student (1954 – 60) in Pune I had noted that dynamic duo of PM Pundit Nehru and DM Krishna Menon had allowed deterioration of Indian armed forces preparedness to remain battle ready by deploying it for civilian tasks of law and order as well as helping out in disaster damage management. India suffered humiliation and paid a heavy price when its was invaded by China in 1962. Indian armed forces have made a steady progress by acquiring some state of the art military capabilities since then. Judging from its rapid strike capabilities to respond to Pak based terrorists and ISI controlled Pak Frontier forces actions at the LoC in J&K I think India has made significant progress. It is still not on par with worlds leading armed forces. This inadequacy would be rectified, in my opinion, only when India can manufacture latest technology driven military equipment to meet and exceed the needs of its armed forces. In manufacturing military capabilities India has a long ways to go to match the capabilities that China has developed. China is at least 30 years ahead of India in this regard. India’s capabilities for export of military hardware is poor as it does not manufacture world class military hardware. I hope you have sound memories of the partition days. I have a querry. Once it was established that partition was inevitable. why could it not have happened peacefully. Why and under what circumstances did the killings start??? I have an the impression that the inter racial hatred between Hindus , Muslims and Sikhs was an entity which had been simmering for a long long time. The killings did not happen spontaneously. It was just waiting to start.Muslims , according to what I know of them were poor as compared to the landed Sikhs and the business men Hindus. The muslims were artisans, badly treated by the Sikhs and Hindus. The under currents were always there. The partition just opened a highway . I was only six at that time. I saw very little, but heard a lot about the gory partition. We shall never know why it escalated to that level. I suspect that the British could have prevented it. The political leaders at both ends were inept and had no experience in the art of handling the crisis. Most of the killings occurred on the journey. The passengers were caught unawares. So much has been written and said, that I do not think that I can add anything new. Thanks a ton. So nice to read & understand about real disciplined force we have, the Best Army of the world, working 24 hours always, and many times more than expected for India & for humanity at large. You are very kind with your words; always and everytime! THANK U GEN 4 VERY INTERESTING FORWARD. A good 2IC is a boon. And Hari was one of the best. However, the art of Command lies in understanding the competence of subordinate leaders and proper delegation to them. Both points very apparent in the blog. You have, as usual, hit the nail on the head! And in some cases, the fault lies with the CO. Some COs feel ‘threatened’ by the competence of their ‘number two’ ! Is there a sequel to the practical idea of preventing flooding of the Kashmir valley sent earlier? While doing these three articles we have stumbled on the biggest scam in India. We find that the flood control and irrigation engineers are always looking for an opportunity to acquire land and indulge in public works. In Kashmir they were demanding one lakh crores from the Central Government to dig an additional flood channel. That would essentially be a diversion of the river around Srinagar. It would involve acquisition of thousands of acres of land. Next would be digging of the flood channel. Then new bridges would have to be constructed wherever roads were cut. The biggest sufferers would be the poor farmers who would lose their land and their livelihood. We have shown that none of this is necessary. Not a single square metre of land needs to be acquired. The cost of de-silting the river and bringing it back to its original level is only a tiny fraction of the cost of a new flood channel. And technically it is a much better solution. Fortunately, we got early support from Mr Ashraf Fazili, a retired Chief Engineer of J & K.
We also put Google alerts on “Floods in Kashmir.” Therefore, we could read articles in Kashmir newspapers and comment on them. Slowly, the word spread and people accepted the idea of dredging and de-silting rather than living with a river that flows ABOVE street level. The Central Water Commission also came around to our idea of de-silting and dredging. Though they have not yet given up on embankments. They have given money for both dredging and embankments. A lot more dredging needs to be done but at least they are on the right track and a beginning has been made. The story of Chennai is similar. The initial reaction from the flood control engineers was to ask for thousands of crores for new drains and embankments. But, gradually, the discourse has shifted towards de-silting the tanks and rivers. Chennai and neighborhood has about 600 tanks. De-silting will increase the storage capacity, thus preventing, or at least mitigating, both drought and floods. conquered both drought and floods. A bigger scam exists at Pune. There is the century old Kadakvasla dam. To augment water supply to Pune, the govt built a second dam at Panshet about 50 years ago. They never bothered to de-silt Khadakvasla dam. Some time later, the government built a third dam, Varasgaon. Now they want to build a fourth dam at a cost of Rs 5000 crores. But enough is enough. Two NGOs have stepped in. Green Thumb and Parivartan have made a start by de-silting the lake. See http://timesofindia.indiatimes.com/city/pune/Area-around-Khadakwasla-dam-desilted-by-Pune-NGOs/articleshow/19250707.cms The NGOs have limited resources — not even a dredger. So they are only tackling the fringes of the problem. Our conclusion is that the flood control engineers have got used to land acquisition and new public works as a way of life. In our caste conscious society, nobody questions the wisdom of the flood control engineers because that is the domain of that caste. You will see that the real progress in low cost drought and flood control has been done by the likes of Anna Hazare. He is not even a college graduate but has done better work than highly qualified engineers. Sincerity matters more than book knowledge. And yes, I am waiting for a piece from you, duly embellished with some pictures! Understand from my 1st J course mate Gen Harbhajan who also fwd this to me that your father was our teacher – is he Mr Kuldip Singh who was our Maths Professor , if I recall correctly . Would be keen to know . Kindly also convey my namaskars and fond remembrances to him . I keep reading some of your writings now and then . May I also compliment you on your beautifully articulated articles . You must have trained your ex 2IC, Hari too in the art of writing ! Brig V H M Prasad. Thanks. Gen Harbhajan is like an elder brother for many of us here in Chandigarh. Shri Kuldip Singh was a close family friend. We went to the JSW whenever there was a function. What excellent forward of Brig Harikumar’s article. Brig Harikumar was my colleague as Colonel EME in the faculty of studies in the then College of Combat(now Army War College) when I was the Comdt. I always found him to be a true professional with a sense of unequalled dedication. The fact that the GOC asked all those questions reflects poorly on a seniors lack of faith in his subordinates. Let me tell of a small incident burnt in my memory. I was a young Capt commanding my battalion’s anti-tank platoon in Bakhloh. We were visited by the Corps Cdr Lt.Gen Henderson Brooks. ( Those days Generals visited units. Brig and below inspected units). The General came dot on time. We officers and JCOS were lined up outside the main office. He shook hands with us. Then he turned to the SM and said.” SM Sahib Khush hai”. ” Khush hai Sahib”. “Jawan aur families khush hain”. “Khush hain Sahib”. Then he turned to the CO and said,” have you got any problems you would like to discuss in your office.” “We have sent our brief to the Bde HQ.” “Good. Please give a copy to my SO.” The SO chipped in to say that he had already got a copy sent through the Div HQ. ” Then why was it not put up to me?” “How can I visit a unit without knowing their problems?” He then turned to the CO and said ” we can go to the mess where I can chat with your officers.” He met us most informally in the mess. END OF THE VISIT. I also remember reading your blog on the late General Hanut Singh Ji. How he wrote on the ACR of your 2ic purely on your conversation and report. THOSE WERE THE DAYS MY FRIENDS. Very happy to see your remarks on this forum. I still cherish the extent of faith you bestowed on me when you asked me to form a special team along with Monu Bhagat and Ratan Kaul to study and suggest improvements in the key processes of the college so that the establishment can serve the student community better. This was probably the very first time when such an exercise was done in a Cat A Establishment. Later on as a Brigadier I narrated this incident to Gen Kochhar , my Comdt at MCEME and he promptly asked me to do such a study in MCEME . The results in both the cases were much beyond our expectations. Thank you for your kind words. We are settled down at Secunderabad and I still work with the IT Industry as an advisor to HYSEA , the association of Software companies at Hyderabad . Our regards to the family. This reminds me of a story i heard about LEH. The field around Leh is barren. when a senior army officer visited for inspection, he just wondered how nice it would be to have trees there. During his next visit , there were 100 trees transplanted from somewhere. The station commander of Guahati AF airfield received the C in C and kept him busy visiting various units, a tea break after one hr, heavy lunch, followed by lectures and sports event at 4 pm and dinner at 7 pm . The c in c was knocked out. he left next day without further inspection. Once more a very interesting piece from you ! 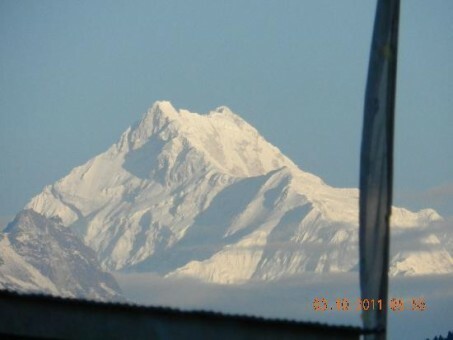 My connection with Sikkim goes back to the mid 1960s & again 1970s—the then Namgyal & Princess Hope were good friends of mine—the Namgyal being a keen Ham Radio operator like myself—–they had a flat on Wood St. in Calcutta & one floor beneath was our flat. Then in the 1970s I was employed with a local electronics firm & one of the tasks given to me was to set up a small industry in Sikkim to make transistor pocket radios—-it was set up very well till of course the political problems started & we took over Sikkim. I think the Division you are refering to–was at one time commanded by a very well known & dear friend of ours—–later Lt.Gen. Inder Gill of Paras. Talyerkhan—I came across a couple of times in the 60s when he used go by road from Bombay to Delhi & break journey at the then Central India Club in Mhow. When my father was GOC 6 Mtn. Div. the CEME was Lt.Col. Hari Apte—–around 1966 ! Fond memories of the good old days ! You must write a piece duly embellished with pictures for our blog. ‘The names you have mentioned remind us of some great soldiers. 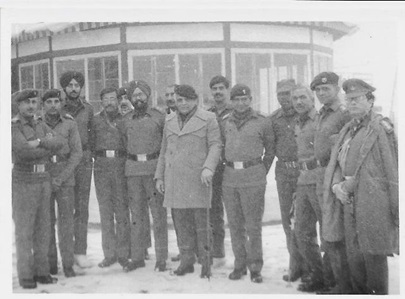 Excellent writeup I must say.Even my memory goes back to the same place during the next GOC’s tenure( though I did go through insp under under Gen VN Sharma too) where his inspecting style was totally different, I am talking of Gen Hanut Singh whom I treat as a role model.48 hours before a tele call from G2SD says that the GOC would be carrying out the annual adm insp of the unit ( I was Adjt sig regt ) the day after.You are left with just one working day that too if the weather God cooperated otherwise doomed which generally was the case with clouds running after you after 11 AM every day.On the day of insp the CO receives the GOC exactly at 9 AM and is introduced to officers and JCOs whom he had not met before. led to CO’s office where the CO’s briefing was expected to last just 10 minutes with just ‘salted nimbu pani served’ and then the General addresses a Sainik Sammelan saying ‘to see your BPET, barracks,or firing etc you have your CO in whom I have full trust and it’s not my duty to test you in those areas, pl tell me if you have any problems which I can solve for you or words to that effect…….’.I watched the General from very close quarters during my stay in Gangtok till May 1983 when I moved out and he too did.A General the likes of whom at least I did not come across during my limited 27 years in the uniform……. My brother Brig. Satya prakash is 85 & ½ now & I am in 84th year . I had seen his photo standing on Lahore Gate in 1965. all his photos & other things had beed Damaged or Untraceable after His first wife’s sudden demise when he was controlling the Border Roads in J&K . He had also been the Editor of EME diary for years & he had stood FIRST in Military Wing , DEHRADUN when he had passed out on 5th or 7th June, 1954 . he had seen & he was in all the three major war theatres of 1962, 65 & 71. 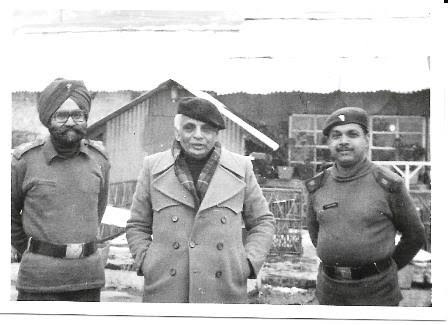 Lt.Gen Brar & Lt.Gen DKMEHTA were amongst his course mates. regards/S C Gupta,Mumbai 9820587609. Excellent write up ,opening the eyes of our Politicians & Civilians alike with remarkable memory. Sirs, I am the younger Brother of retired Brigadier Satya prakash of EME Corps. I understand the value of EME as well as ARMY’s role in PEACE TIME . Though EME NOT be the actual fighting Force but it is a very vital to our INFANTRY < ARMOURED & ARTILLERY FORCES , fighting & Supporting them side by side all the time . Mr brother, Retd. Brigadier Satya Prakash was in all the three major War theatres of 1962 in Bomdilla,1965 in Lahore sector& in 1971 in Sialkot Sector . The importance of EME is well u/stood by our ARMED FORCES.rgds/ SC GUPTA. Thank you Satish . I did not have the privilege of knowing or working with Brig Satya Prakash . I am glad you liked the piece on Army Inspections. Amazing wit, brings back fond memories and makes us realise the amount of work that must have gone in to running that unit. It’s a lesson in leadership , delegation , trust and teamwork . This is what we need to exhibit in our work on a day to day basis in corporate India . As army kids , We simply enjoyed Sikkim collecting strawberries from the hills and racing up the hills with no general timing us. I think we were not bad, also ! Congrats and thanks to Brig Hari Kumar Uncle to bring those memories back with this anecdotal article . You army kids have done us proud by your performance. The children of the civil services officers are ‘spoilt brats’ in comparison! Thank you Jasdev. I am glad you liked the story. I believe that this takes more time than running the full distance on level ground. Your guys were very fit and well trained. Yes, Jo. Our men were very fit. My predecessor and Hari had a very good rapport wit the EME Records, and they had managed to get some very tough guys posted to our unit. One-third of my Battalion was located at altitudes above 10,000 feet. This test was conducted at a lower altitude, and that was another factor. And indeed, they had prepared in all earnestness. I had forgotten this inspection altogether; because I contributed very little in this exercise. But the performance that day established our credentials, and made it easy for us to try out our experiments. Thank you Sir. You are absolutely right . This needed continuous practice at least for a month . The only saving grace was the GOC did not ask us to do it the other way . Takes me back to when I was with Western Command Signal Regiment at Jatog in 1965 and again wit @0 Div in 1969. Inspection was one of the most difficult tasks the war was simple. Well written article and well presented. The author not only has wonderful memory but has a good skill to recall & put it in black & white. Besides the author has preserved memories through old photographs well preserved. The modern technology through digitization, as has been applied here, is now helping to preserve all what we want & dig out the desired information at anytime as needed to be made available anywhere in the world. I congratulate the author & GUFTAGU@AMOLAK.IN for tbis post.